One of the things I love about landscape photography is finding beauty in unexpected places. Many times you are in such a hurry to compose as many variations of a scene during the fleeting moments of sweet light available to you, that you don't REALLY get to take all the details and nuances in visually. As I went into my 2010 archives, I came across this shot. I was capturing the sunrise on a clear morning on the South African "Wild Coast" near a little town called Haga-Haga. 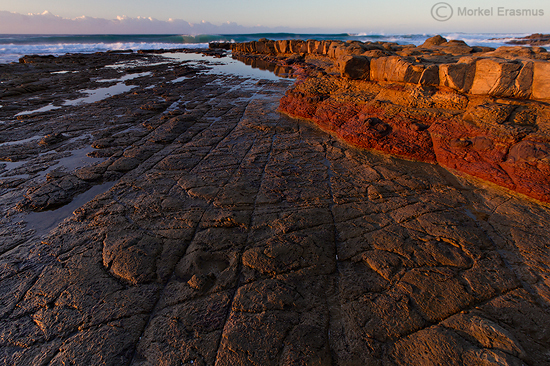 I was changing compositions here from the rising sun over the coastline to the interesting rock patterns that ran into the ocean perpendicular to the rising sun. I noticed the light was hitting the rocks nicely, and with only a little cloud cover in the sky on the horizon-line, I decided to compose for majority land and minimal sky. Only after viewing it on my large screen at home did I notice the lovely nuances of colour and texture in the rocks patterns, and the way the rocks act as converging leading lines with the creases in the rock "floor". I blended two exposures here to achieve optimal dynamic range. Hope you liked this one! Let me know what you think, and if you've had similar experiences. Some exposure in the UK newspapers! Good news everybody! The online editions of the popular UK newspapers the Daily Mail and the Telegraph picked up a series of photos of mine to publish this week. The photos cover unusual behaviour by an African Tree Squirrel. I am stoked about this exposure, and hope this is the start of more similar opportunities. 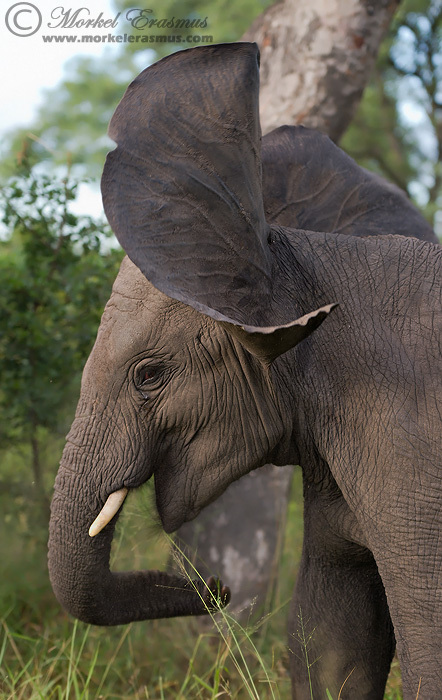 We spent this particular morning in February 2010 on a game drive in the Sabi-Sands Game Reserve, and came across a small herd of African Elephant consisting of cows, calves and this young bull. At one point he was right next to the vehicle, and something irritated him...causing him to shake is head vigorously from side to side. I loved the way this frame captured the flapping ears. He was very close (focusing distance 3.98m) and so I used an aperture of 2.8 to ensure only the necessary detail was in focus, placing emphasis on the face and eye. I am swamped at the moment...but thought I just HAD to do a quick blog post, even if it's just to share a photo I processed recently and enjoyed viewing. 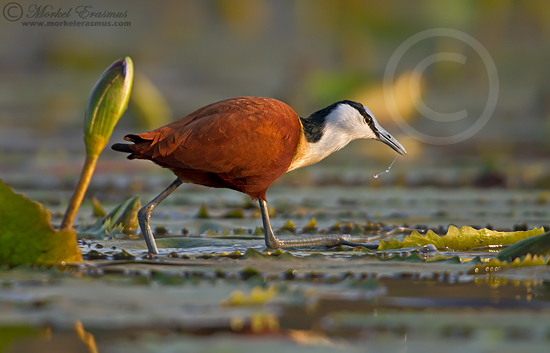 This African Jacana adult was photographed from the rim of a small boat on a pond near the Kruger National Park, South Africa. Many die-hard bird photographers will bemoan the "head angle" here (the fact that the head is turned away from the camera ever so slightly), but I do feel the very low angle placing the viewer in the bird's environment is the strong point of this photo, and it actually dominates anything that could be found wanting here (combined with nice golden light of course! ).